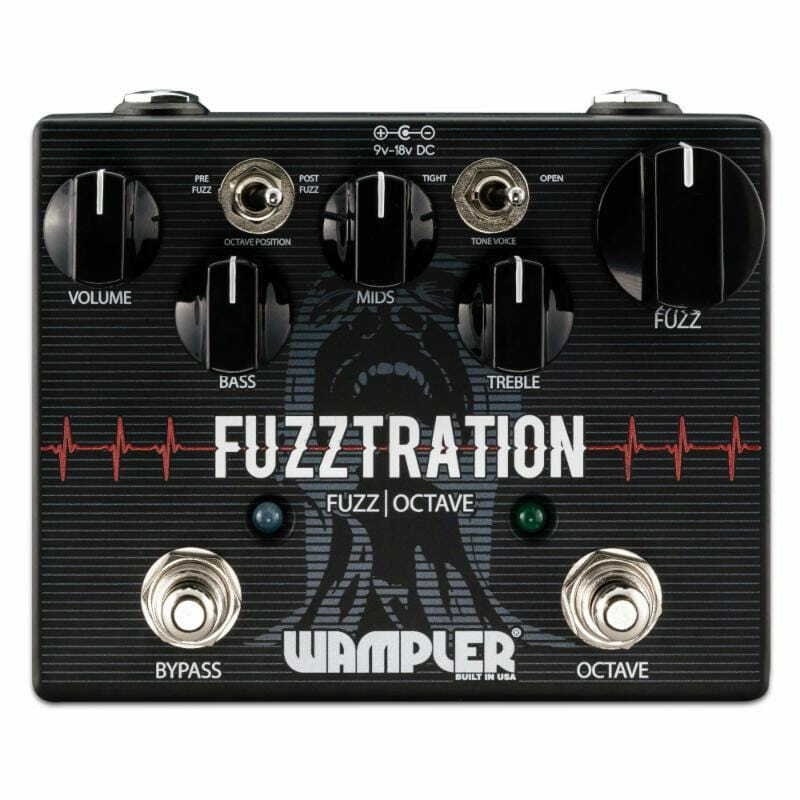 The Fuzztration isn’t a pedal designed to really play “nice.” It’s brash, raspy, doomy, in-your-face fuzz from top to bottom. This is not to say it can’t get some intensely classic Floyd sounds, but this isn’t just another classic with some added EQ options. It’s rough, it’s gruff, and it’s like an angry lion trying to bust out of its cage. When the search for the perfect fuzz leads to a plethora of choices, the end of your Fuzztration comes when everything is packed into one, do-it-all fuzz box. 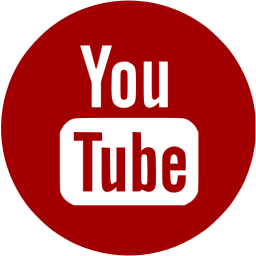 Want the classic sounds? Done. How about some raunchy doom metal or sludge rock? Yep, it does that too. • The volume knob is pretty self-explanatory, but it controls the overall output of the Fuzztration. • The Bass controls the overall low-end response of the Fuzztration. 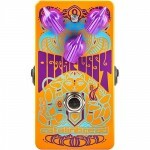 Noon is standard, counterclockwise it removes some of the bottom end that warrants a more searing tone, where taking it clockwise will increase the bottom end tremendously, going from a raspy fuzz to full-on doom machine. • Mids controls the mid presence of the circuit. Center is fairly flat, counter-clockwise will scoop the mids and become much more aggressive and cutting, almost distortion-like. Clockwise will add in some mids, which helps combat the scoop that lead many of those old classic fuzzes to be lost in the mix with the full band. 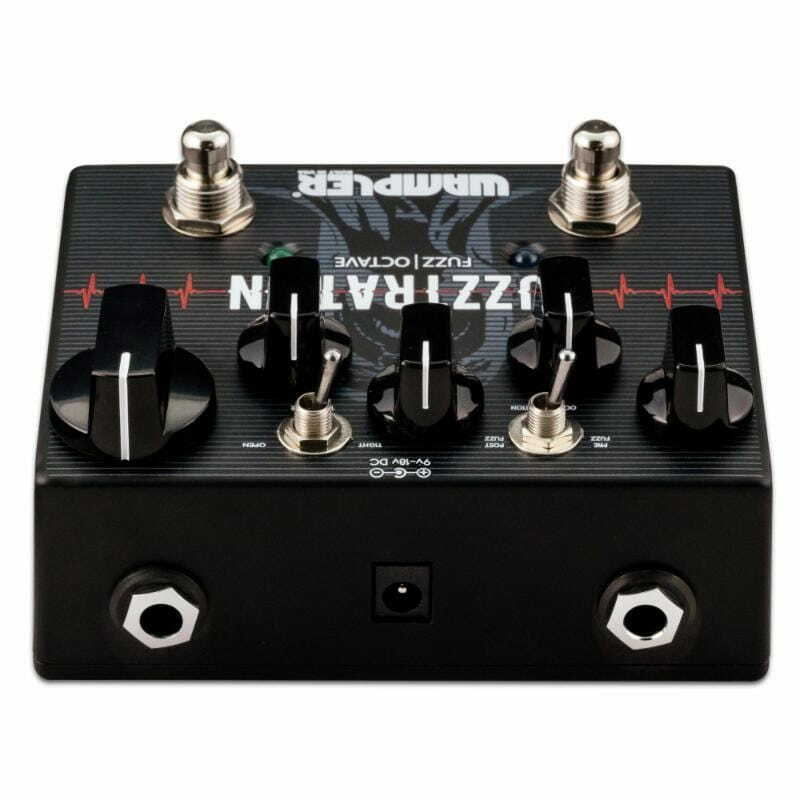 • The treble control effects the overall high-end and brightness of the circuit and has a tremendous effect on the overall way of shaping the tone of the fuzz. 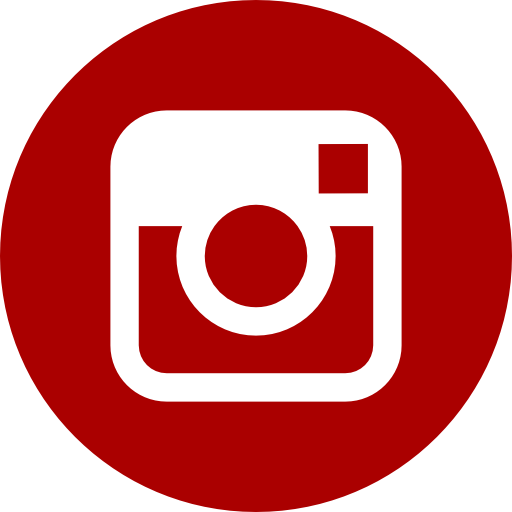 Noon is standard, going counter-clockwise will yield in a much thicker, saturated fuzz tone that sounds like a wall of wool coming from the speakers. Clockwise will increase the brightness, and thus the raspiness and spit of the fuzz depending on where you have the voicing switch set. • The Voicing switch gives you two very different but usable sets of tones. On the Tight setting, it has a classic, more modern sound that’s...well, tighter, less sag and act more as a fuzzy distortion that totals up to a sum of a whole lot more than that magical number of 3.14. The Open setting is much woolier, darker, saggier, and an overall thicker and sludgier fuzz tone. The huge Fuzz knob controls the overall amount of fuzzy goodness. This pedal isn’t designed for sparkly edge-of-breakup tones, so even fully counterclockwise it yields a thick, sputtering result that works great for alt-rock and grunge. 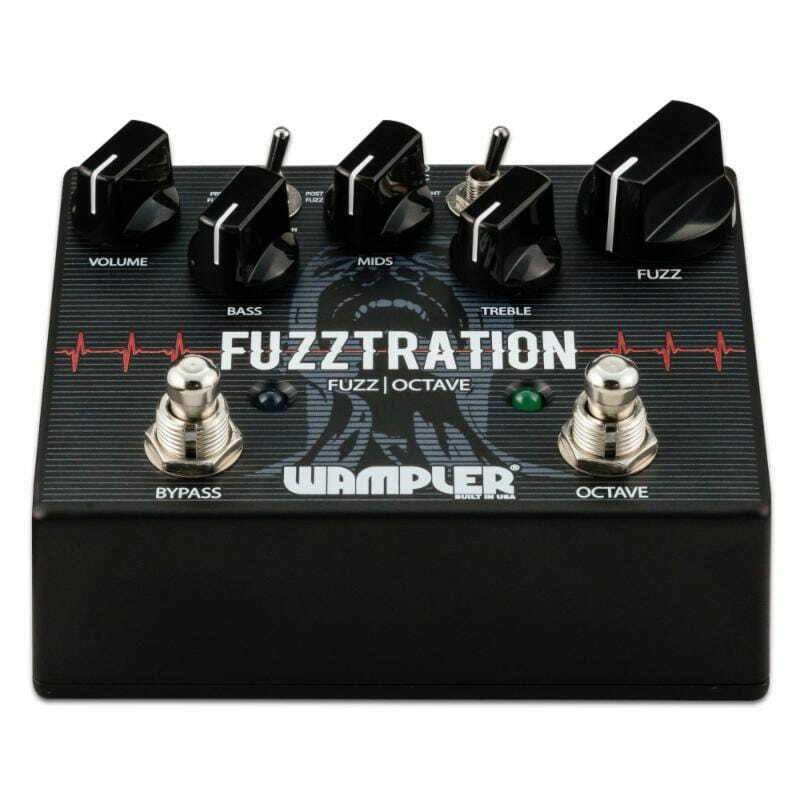 Turning the fuzz knob clockwise unleashes a torrent of fuzz, leading to massive sustain combined with some compression, classic velcro sputters and everything in between. The octave effect is completely independent, so it works great with other pedals as well as alongside the fuzz in the Fuzztration. It works great for adding some extra zing to your lead playing, or an added dimension to your rhythm playing. It’s kind of glitchy and can get into ring-mod territory depending on where you’re playing at on the neck. This effect is all about dynamics, so the softer you play it doesn’t “trigger” it as much as has more of a glitch effect. Dig in with your playing and the octaves will seem to jump directly out of your fingers. Having the octave set pre-fuzz (or dirt) will yield a more classic octave tone, one that jumps out the higher you move up the fretboard. Setting the octave post-dirt yield’s a much trippier, harmonic onslaught that isn’t for the faint of heart, but provides a truly unique and wild sound that you have to play to understand. 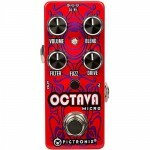 Pigtronix Octava Micro is an expanded version of the octave up found in the original Pigtronix Disnortion pedal.